Bedeschi is celebrating the completion of a major contract in Italy. 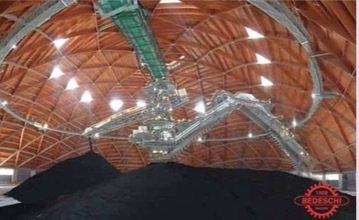 The project, for Enel, is a turnkey solution; it includes the engineering, construction, complete supply of materials, commissioning and start-up of the equipment to develop the 2,640MW coal storage facility at the power plant. South Brindisi is one of the biggest coal-fired power plants in the country. It is operated by ENEL Produzione S.p.a. The power plant will utilize coal sourcing from Indonesia and South Africa. The project has taken into account environmental concerns and is intended to replace the current outdoor longitudinal coal storage at the power plant. This involved the implementation of two new domes with a wooden covering structure and an environmental impact almost equal to zero. In December 2013 Bedeschi started the erection phase of the first dome, while the second one started in April of that year. By the end of 2015, both installations had been positively tested and accepted by end user. This represents another great success for the Bedeschi team.